The Liebherr Group notched up a company record turnover of $11.8 million in 2018, representing an increase of $828 million, or 7.5 %, compared with the previous year. Despite a slight decline in overall economic growth, revenues from construction machinery and mining equipment rose by 10.8 % to $7,761 million, with especially strong contributions from the Earthmoving, Mobile Cranes and Mining divisions. In the other product areas, which include Maritime Cranes, Aerospace and Transportation Systems, Gear Technology and Automation Systems, Domestic Appliances, Components and Hotels divisions, turnover rose by a total of 2% to $4,168 million. Record sales generated in 2018 can be attributed to the very favorable economic conditions and higher demand in several sales regions. Sales continued to increase within the European Union, which is Liebherr's most important sales region. This can be attributed, among other things, to renewed growth in Germany, which is Liebherr's largest market, and to the positive economic situation in France and Great Britain. In the non-EU countries sales revenues fell in EUR terms compared to the previous year, mainly due to the development of the currency exchange rate in Russia. The business also performed very positively in North America, Central and South America, and Asia and Oceania, driven in particular by the markets in the USA, Australia and China. The Liebherr Group achieved a net profit of $360 million in 2018, slightly above the previous year's level. The operating result remained stable compared to the previous year. The financial result declined, mainly due to negative effects of currency movements. 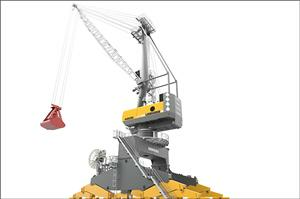 Liebherr invested $656 million in research and development last year. The bulk of this was used in the development of new products. A large number of joint research projects with universities, other higher education institutions and research institutes were initiated and continued. Important issues across the wide range of products and services include, as they have done for many years, increasing energy efficiency, networking, automation and lightweight product design. $929 million euro was invested in the production sites and the global sales and service network. This means the Liebherr Group increased its investment activities by $57 million compared to the previous year. Offset against this was depreciation of $575 million. Liebherr said it expects demand in most regions and industries may develop very positively in 2019, and therefore, the group expects sales revenues to continue to rise in 2019. The order books which were already nicely filled at the start of the year also suggest this, it added.